The vanity guys just left after installing the wenge floating vanity and they were so patient with me. I was concerned that the faucet would be bumped by the medicine cabinet doors if we set it at regular height, and they measured it out perfectly. The vanity is set at 28" off the floor with another 1" for the countertop. That's about 3" lower than normal but because we have the vessel sink it doesn't feel low. It turned out to be a very good thing that we placed it lower because the plumbing is low in this bath, and the wastepipe would have been smack on the bottom of the cabinet otherwise. As it is, after the plumber has decided where the sleeve for the P-trap will fit, I have to take the drawer back to have it notched. 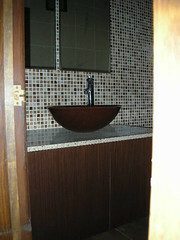 I don't feel so bad about mis-measuring the plumbing in the girls' bath now, or about adapting the vanity in there. But don't you think the vanity's awesome? 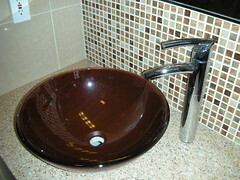 And as for the faucet and wood-effect glass vessel sink: pure fabulousness. Eye candy indeed! The bathroom has really turned out beautifully!! Congrats!